In 2017, Toyota GB announced a partnership with Guide Dogs. Their 1 year goal was to provide support for a working dog partnership for 10,000 days – an achievement reached in only 6 months. Roll on to early 2018, and the very first of 4 guide dog puppies has been named and is ready to begin training. Toyota GB welcomes Banjo. To train a Guide Dog it costs £10,000 and a further £55,000 to support it throughout its life, but the aid they provide is invaluable. How was the money raised? May – The Toyota Directors’ Challenge. £60,000 was raised when company directors walked and cycled the length pf Hadrian’s Wall. October – Toyota Marathon Walk during Guide Dog week. After taking part in an awareness building week with special talks and training with the dogs, around 30 staff members took part in a local marathon walk. What are Banjo’s first steps to becoming a guide dog? 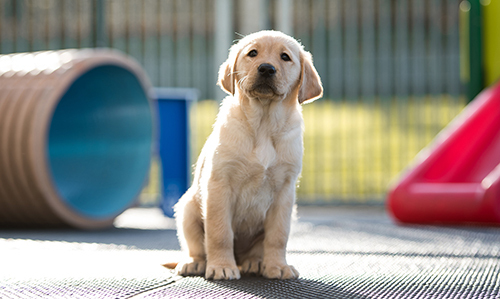 At 6 weeks old, Guide Dog puppies spend a week at the Guide Dogs National Training Centre where they are given socialisation and habituation training. Here they spend time with other dogs and people, which encourages them to be happier, more predictable, friendlier and how to handle stress. Banjo will be introduced to a variety of different sounds and sights. He’ll be handled and touched with different textured materials and encouraged to play with new toys. Some hard, some soft and some noisy. 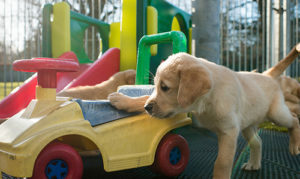 The puppies also get introduced to everyday sounds such as keys jangling, washing machines and car traffic. After Banjo’s week at the Guide Dog National Training Centre comes to an end, he will spend a few months with a normal family, who will be known as his walking family. All he has to do is get used to normal everyday life within the household. It’ll take around 2 years until he is ready to be matched with a partner. Although the success rate in training and partnering Guide Dogs to blind and partially sighted people is very high, there a few who grow up to become unsuitable. These dogs normally go on to become assistance dogs elsewhere in society. Overall, Toyota have raised enough money to fully train and support Banjo for his whole life and risen enough to initially train 3 other puppies, Poppy, Elsie and Genchi.